Formula BMW star Oliver Turvey gained the honours in this award last night, and his prize package includes £50,000, a race entry in the Porsche Carerra Cup and a McLaren F1 test. He becomes the 18th recipient of the award: the first, in 1989, was David Coulthard, one of four winners to race in Formula One. Oliver Gavin, the Award winner in 1991, heads a string of seven men who are, or in the case of 1992 winner Dario Franchitti, might soon be, front runners on the sportscar racing scene. 1993 saw Ralph Firman Jr take the laurels: he spent 2006 in Super GT in Japan, with 1994 winner Jamie Davies plying his trade in Team Vitaphone’s Maserati MC12 in FIA GT. Jonny Kane was a winner in 1995: his 2006 season saw a full Le Mans Series entry (plus the Le Mans 24 hours) with Spyker Squadron. 1996 winner Darren Turner is another man who needs no introduction to dsc readers: his 2006 efforts in the ALMS and at Le Mans aboard Aston Martin Racing’s DBR9s, and in the BTCC aboard a SEAT Leon, showed again that Darren has talent to spare. He is waiting (reasonably) patiently to see what emerges from AMR’s off-season work to build a 2007 programme. Finally in the sequence came 1997 winner Andrew Kirkaldy, a judge this year, who coupled his running of Formula Renault team AKA Racing with the FIA GT Championship (and Le Mans 24 Hours) aboard a Scuderia Ecosse Ferrari 430. It may yet be that we see the rapid Scot aboard a GT car again in 2007: whether in Europe or the USA, or whether aboard a Ferrari or something else, remains to be seen. 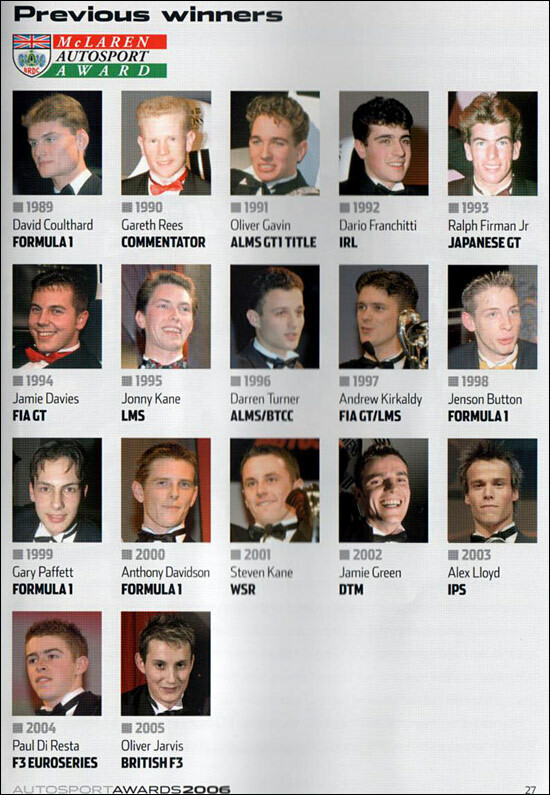 One final mention – to Anthony Davidson, for so long the bridesmaid in F1, apart from three race starts (for Minardi and BAR Honda), he has now signed for the Super Aguri squad for the 2007 F1 season. Why the mention here? Davidson contested the 12 Hours of Sebring and the Le Mans 24 Hours aboard Prodrive Ferrari 550s and is remembered fondly by the whole team. Good luck Anthony. (sadly in a Super Aguri you’re going to need it! ).